As Rhonda mentioned last week, I joined a group to trek Mt Kenya. The back story is that I wanted to do something big, now. Basically, I have been working about 15 to 20 hours per week, but my company may hire me in the next couple of weeks here in the Nairobi office to work full time. Also, since Margaret started I did not have to be home everyday to watch the kids. So now was my chance to really get out there and see something. At first I was not really thinking of Mt Kenya. I did not want to deal with potential altitude sickness (16,355 ft), getting warm/winter clothes, and outdoor gear. I really wanted to venture up to Lake Turkana and see the desert and get off the beaten path. But one of the tour companies I contacted said, due to the security situation, they were not going up there anytime soon. Seems last month there were issues between two tribes involving cattle rustling and over 30 policemen were killed. Hmmm, probably best to stay away for awhile. So it was on to Plan B and luckily on the Nairobi expats facebook group there was a posting about a group heading to Mt Kenya. I met up with some of them for lunch the Friday beforehand and got the low down. We would be going up one side of the mountain and exiting from the other. It would be a total of four days - leave Wed and be back in Nairobi Saturday. Sounds good - I just needed to gather tons of cold weather and hiking gear. Of course I had all that stuff back home in NY but when packing for Kenya earlier this year I thought, "why would I need that in equatorial Kenya!?!" Shiku, who was one the main organizers, advised me of a second hand clothes market in Nairobi and I dragged Rhonda and kids there a couple days before departure. I was able to pick up: 2 long sleeve non-cotton shirts, 1 parka, 3 hiking socks, 1 fleece, 1 rain suit, 1 wool hat, 1 pair thermals, 1 pair gloves, and a backpack. Another big help was the dad of one of Ruby's classmates was able lend me his hiking boots. I also had to buy headlamps, some kind of pills to head off the worst of altitude sickness (Diamox), water purification tablets, and rent a sleeping bag - it was full time job just to get prepared! We met up at 7:30am Wed morning in Nairobi and took a nice 4 hour drive through the Kenyan countryside up to the trail head at Sirimon gate. There we met our porters and chef. It was nice to know we would not be lugging our gear ourselves - we just had to be responsible for our daypack. We then had a trail lunch and started off. After a three hour hike we reached Old Moses camp - above the tree line. We spent the night there and after breakfast we hiked all day to the next camp - Shipton's, which was beautifully situated right below the peaks. The group I joined was a pleasant surprise, since I did not know any of them. Some of the group knew each other but we gelled quickly. There were nine of us from many different places but all now living in Nairobi - a US embassy worker from Atlanta, a NGO worker from Ireland, UN workers from South Africa, Spain, and Kenya, consultant from South Africa, student from Germany, and our key Kenya contact Shiku who did most of the organizing. One of the guys was even Jewish and he brought along a menorah and we lit the candles for all the nights. The accommodations in the camps were very spartan. Just bunk beds with foam mattresses. I was pretty nervous about getting altitude sickness and/or stomach ailments since we were just taking water from streams and I could not vouch for how clean the cooking and food was. But nothing happened and I actually liked all the food. One night we had fish and another night was fried chicken. A couple afternoons we had popcorn as an appetizer. We also met other groups and hikers in the camps who were interesting to talk to. One other group was about 15 to 20 ten-year olds from an international school in Nairobi. They had already reached the top and were on the their way down - of course we felt if these kids could do it - so could we! They had an American guide with them who sobered us up about how intense the hike would be. Earlier in the day, after his group reached the top, one of the kids was going down too quickly and fell about 25 feet - seemed he got hurt pretty badly and they had to airlift him off the mountain - eesh. I also met a UK guy who was traveling around after teaching English in Uganda. He said his favorite experience in Africa so far was going on a mountain gorilla hike in Uganda -- have to add that to the list! The route we took to the camps was very scenic, so most of the hiking was quite enjoyable. For the summit attempt we left Shipton's camp at 3am to get to the top by sunrise. It was novel to be hiking at night with only the light from our flashlights leading the way. After about 2 hours we saw our first snow and by 7am we reached the summit. It was breathtaking to be on the top - high above the clouds with glaciers and mountain lakes all laid out below you WOW! After lots of picture taking we started our LONG trek back down. This was going to be our most intense day. It was 10am before we even got to our breakfast camp at Minto's Hut. 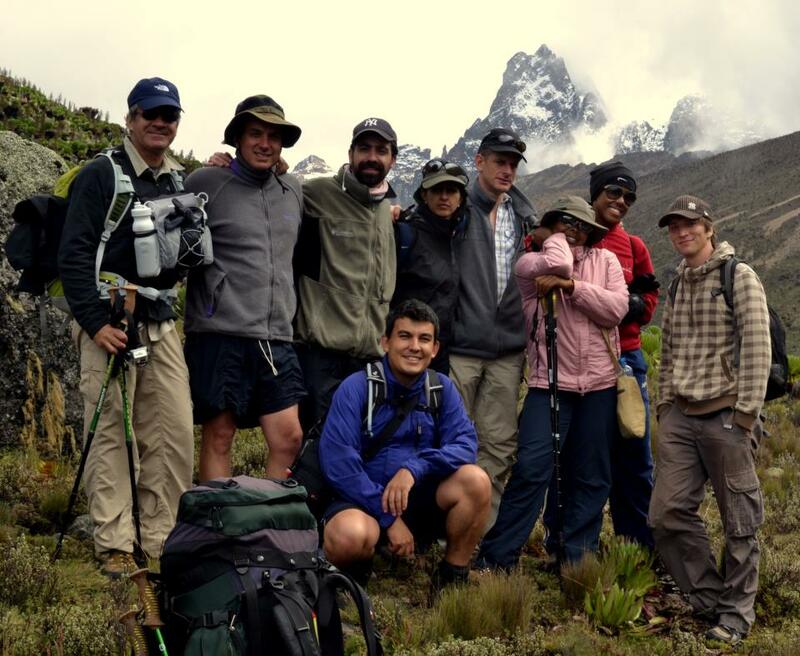 We rested there for about 2 to 3 hours and then started a long walk to camp for the night at Meru Mt Kenya cottages. We were surprised to see that the route down we even more scenic than the route up. This helped pass the 6 hours it took us to reach the camp. What an epic day - started hiking at 3am and finished at 5:30pm. In retrospect in might have been better to say overnight at the place where we had breakfast and have a more relaxing trip down. Unfortunately one of the people in our party was really not feeling that well and took even longer to get down, their group did not get down to camp till after nightfall and they did not have a pleasant experience. Some of them did not have their headlamps on them and the porters realized what was happening and collected the headlamps from those of us who were already down and ran back up with them. After the second group got down at around 8:30p they told us how the porters were even more scared then they were - seems there are elephants and buffalos in the woods near the trails and it was dangerous to be out at night. They said they could see the reflection of the animals eyes when they shined their headlamps into the woods. The next morning some of us hiked an additional two hours down a jeep path and rest took a 4X4. It was unreal to see how the Land Rovers could maneuver down this 'road'. At certain points the vehicles were at 45 degree angles going through deeply rutted paths. Finally at about 2pm we reached the town of Chogoria and caught our ride back to Nairobi. What an experience! For those interested, there are more pictures/captions/info here.